Wilton’s Music Hall Needs Your Help! Download Wilton’s Music Hall’s new App to help save the building! The guys behind the lovely Wilton’s Music Hall have just launched a fantastic new app to help save Wilton’s building. It’s only £1.49 and great fun! 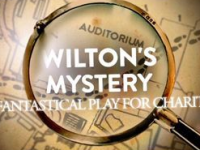 It’s a ‘play’ for charity – unique to Wilton’s and based on a true story from our building’s rich history. So just download the app to discover lost rooms and forgotten secrets; unlock floors and doors to release the hidden past! They have to raise £300,000, so they can finish repairing the houses at the front of the auditorium and that’s why they created this great and fun app. So if you are one of Wilton’s Music Hall fans like us do help them spread the word!